FOX 31's Eli Stokols reports–it's a beautiful ride, so why not? 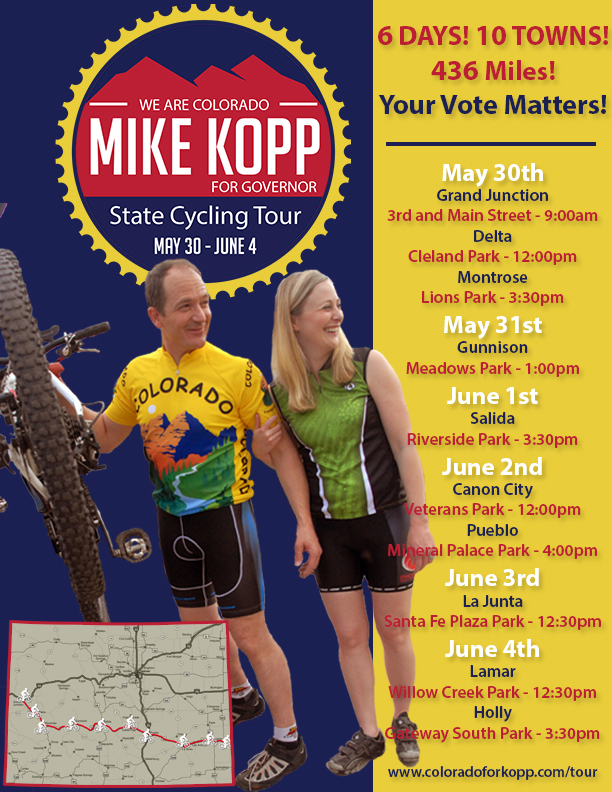 Spandex generally isn’t a good look for politicians–for anyone, really–but that’s not inhibiting Mike Kopp, who launching a statewide bike tour this Friday in an effort to connect with voters in every corner of Colorado ahead of next month’s GOP gubernatorial primary. Kopp, a former state Senate Minority Leader, won top-line on the primary ballot at April’s state GOP assembly but remains an underdog in the party’s four-way gubernatorial primary. Tom Tancredo, Bob Beauprez and Scott Gessler have all raised more money and have higher name identification with voters than Kopp. In response to Bob Beauprez's growing stack of big-name endorsements, Scott Gessler's late fundraising surge and upcoming TV campaign, and Tom Tancredo's built-in base of fanatical support, rapidly-fading GOP gubernatorial candidate Mike Kopp is embarking on a 430-mile bicycle tour of some of the most remote areas of the state! Now, don't get us wrong, it's really beautiful country out there riding from Grand Junction to Holly by way of Gunnison, Pueblo, and La Junta, maybe the most beautiful stretch to ride a bicycle to be found anywhere until you get to Pueblo–but he's avoiding the largest population centers in the state, the Denver and Colorado Springs metro areas. Otherwise known as "where the votes are." It depends on what the motivation is, folks. Despite Kopp's victory at the state GOP assembly, which sources say had more to do with maneuvering by candidates petitioning on the ballot to deny support to Scott Gessler, his chances of actually winning the nomination are slim and shrinking fast as the other candidates hog the spotlight. Kopp doesn't have enough money to compete, but he does have enough to mount a campaign swing through the hinterland. Which happens to be at the perfect time for a bicycle enthusiast to ride through the Rockies. In 2010, Dan Maes paid his personal bills with his gubernatorial campaign. Kopp has no need to do that, of course, but if he's going to lose anyway, why not have a nice expense-paid ride through the Rockies–with only a pretense of being "campaign related" necessary? You only live once, so we say ride on. Why the hell not indeed. You gotta be in pretty damn good shape to pull that off, so I have to give the man credit. Enjoy the ride. Me? I'd head off to the Caribbean for some diving. (But if long distance cycling is your thing, then it's a great ride. And, if running for Governor is your thing, then muck some stables.) To each his own. Too bad Knopp doesn't stand any better chances in this race — he's obviously the best of the GOPers running. I think it's great that he's doing the ride, but 1 mountain pass in 6 days? Call me a bike snob, but Ride the Rockies will do that that much climbing every day for a week. …. are Republican primary voters really avid cyclists? … especially in the counties he's biking through? A "real republican" would at least do it on a motorcycle, right? AHEM. Senator Greg Brophy. I'm surprised he's not following along in his road bike. Crap, I'm a Dem who's voting for Hick and even I'm impressed by this. Heck, I'm might pull out my bike and join him for a section. I’ve ridden with Mike, strong biker, disagree with his politics, but he’s a nice enough guy. Oddly, I also sat next to the little Prius driving used to wanna be gov from Wray at the state mountain bike annual meeting a few years ago. I agree. Mike's not going to win this primary, but he's an all around good guy and I'd NEVER try to outbike him. If I lived in rural Colorado I'd applaud. Some of those folks tell me they feel ignored by most in the state capitol (including some of their own legislators). As to the text about his "all expenses trip", I'm sure all the free gasoline for Kopp's bicycle will be a great perk! Not to be outdone, Tom Tancredo is going to don a Speedo and "Swim for Votes" in Antero, Blue Mesa, La Jara, and Vallecita Reservoirs. Shoot. I can't un-see that.